StudioLive® AR8 USB 8-channel hybrid mixer makes it simple to mix and record live shows, studio productions, band rehearsals, podcasts, and much more. This is a musician’s mixer: lightweight, versatile, feature-rich, and packed with analog connections and digital tools, yet easy to learn and use. Mix with PreSonus’® famous Class A preamps and three-band EQ. Create multitrack recordings and fly in backing tracks with a 24-bit, 96 kHz, USB 2.0 digital audio interface. Record and playback in stereo with the integrated SD digital recorder. Stream program music wirelessly, using onboard Bluetooth®. Compact and road-ready, StudioLive AR mixers provide a superior all-in-one solution for mixing and recording your performances. Most mixers make you route acoustic and electric guitars and basses through external direct boxes before connecting to a mixer input. But with StudioLive AR mixers, Channels 1 and 2 have high-impedance instrument inputs, so you can plug a guitar or electric bass straight into the board, no direct box needed. Our unique Super Channel (stereo Channel 7/8) allows you to connect four stereo analog and digital sources at once, enabling you to use the mixer with your high-tech devices. Plug a media player into the Super Channel’s unbalanced RCA and 1/8-inch stereo inputs, play stereo audio from the onboard SDTM recorder or from your USB-connected Mac® or Windows® PC. Use onboard Bluetooth 4.1 to pair your phone to your StudioLive AR mixer and instantly have wireless access to your music library for break music, backing tracks, or ear-training. Have a song you want the rest of the band to learn? Pair your phone and start rehearsing! RECORD IN THE STUDIO OR AT THE GIG WITH OR WITHOUT A COMPUTER. Naturally, you want to record your gigs, as well as producing studio projects, podcasts, and so on. It’s smart to record your rehearsals, too. So StudioLive AR mixers offer two different ways to record. 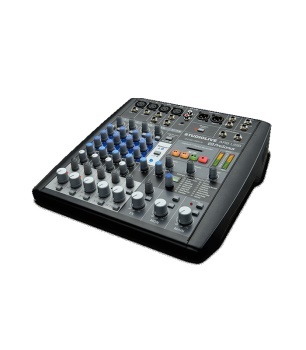 Connect a StudioLive AR8 USB mixer to your computer via USB 2.0, and you have an 8x4 multitrack digital recorder, ready to capture all input channels plus the main mix to a Mac or Windows PC with professional, 24-bit/96 kHz quality. An onboard stereo SD recorder lets you record the main mix without a computer, just hit Record and go. Recording can’t get much easier than this! Both the integrated USB recording interface and the SD recorder have multiple uses beyond simply recording. With just a few backing tracks, your small band can sound like a much larger act, so we enabled the USB interface to play back two stereo streams through the mixer, great for backing tracks, click tracks, or program music. Use the SD recorder to play up to 32 GB of MP3 and .WAV files for hours of program music or backing tracks without needing a computer. And don’t forget the Bluetooth feature in the Super Channel, which lets you play break music straight from your smartphone. With several ways to get the job done, you can work the way you want to. PreSonus StudioLive AR mixers are tightly integrated with state-of-the-art recording software to help you achieve your creative vision. Record with PreSonus’ CaptureTM live-recording software, then edit in our award-winning Studio One® Artist DAW (recording and production software); both are included free. SWEETEN WITH DIGITAL EFFECTS FOR A POLISHED, PROFESSIONAL CALIBER SOUND.